This project was done by pupils of First and Second Classes. The story of Dame Alice Kyteler is a well known story of a woman called Alice Kyteler who lived in Kilkenny in the Middle Ages and who was accused of being a witch. Pupils tried to illustrate the story by making a model of her castle and of Alice and her cat. Myth & Legend / History. This is Alice Kyteler’s castle with its stain glass windows. Alice is coming out of the castle. Her cat is beside her. The theme of the project was ‘Myth and Legend’. Pupils read the story of Alice Kyteler. They also read other stories related to the topic e.g. Joan of Arc. They also researched Medieval Castles. Vocabulary relating to castles, e.g. 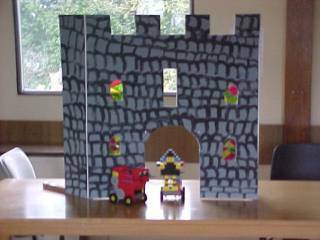 drawbridge, towers, battlements, etc. Discussion of what kind of voice might best portray witches, ghosts, goblins e.g. high-pitched for witches, deep heavy voice for ghosts, sweet endearing voice for fairies. Choral Verse Speaking “There Aren’t Such Things”. Poem about witches, goblins, wizards, etc. Use of the voice to portray characters. Older pupils recorded the children reciting the poem into sound files on the computer. They painted stone wall effect.